Did you ever work at the Middleville building? Below is information from R-UTN member John Kobel on the continuing HEALTH problems at the former Middleville Middle School – now Northport Middle School. It is important that any teacher who worked there at any time read this and respond if it applies to you. Since at least, the early 1970’s this has been a “sick” building. During the “70’s and 80’s” there were many teachers who had miscarriages and some whose children were born with birth defects. There have been a number of teachers and staff and, yes, children who have been diagnosed with various types of cancer and lung/breathing problems. This is continuing to the present day. Teachers, staff and students who have classes in K building as well as G and H buildings are sick now. They have been diagnosed with high levels of carbon monoxide, exposure to benzine and other chemicals. Anyone who has ever been in this building for any length of time can have health issues. The parents of a number of students who have been diagnosed with these medical issues, as well as some current teachers have gone to countless Board of Education meetings to raise these issues. Many of them have filed papers from their doctors and medical labs with the District office and yet, it seems that none of these have made it to the School Board members, so they are asking for our help. They are asking that any teacher, staff member or administrator who ever worked at the Middleville Road building who has been diagnosed with any form of cancer, or any type of lung and breathing issues, or any other abnormality like miscarriages to please share their stories with them and perhaps even share their stories with the law firm they have signed on with. Also, if you know of any faculty, staff or administrator who has passed away from any of these issues please share those names as well. These parents have spent countless hours and days researching the past history of the building as well as the property that it is built on in an attempt to protect their children. They have found documents going back to the 1940’s showing that this property, and the surrounding area, were used as a landfill. No one really knows what kinds of materials are buried underneath this building that could be leaching up into it. I am asking for your help to help these parents, students, current teachers, administrators and staff who continue to get sick simply because they have to work in this “sick” building. If you are able to help, please email the information to Bobbi Scott and use the subject “Middleville Road building“. We’re facing a pivotal moment in our fight for justice. This month, the Supreme Court will hear Janus v. AFSCME Council 31—a case brought by corporate elites to further rig the rules against working people. We need your voice to be heard against these wealthy special interests. Sign the petition to tell the Supreme Court: Protect working people’s voice on the job! Fifty years ago this month, some 1,300 African American sanitation workers faced a pivotal moment when the tragic deaths of Echol Cole and Robert Walker helped spark the historic Memphis sanitation strike. Dr. Martin Luther King Jr. soon joined the AFSCME members in demanding recognition of their union, basic safety standards and a decent wage. Undercutting our right to organize exacerbates the racial wage gap and starves the unions that give communities of color a voice against corporate interests. Sign the petition to tell the Supreme Court: Stop dangerous “right to work” laws that take away our freedom! Corporate lobbyists, extreme legislators and greedy CEOs want to weaken working people’s collective power by denying our right to join in union. They are asking the Supreme Court to strip our freedom to speak out together for fair treatment, better wages and safe working conditions. Before the end of the week, we need 20,000 people to speak out. Add your name now: Tell the Supreme Court to defend working people’s rights to join together. 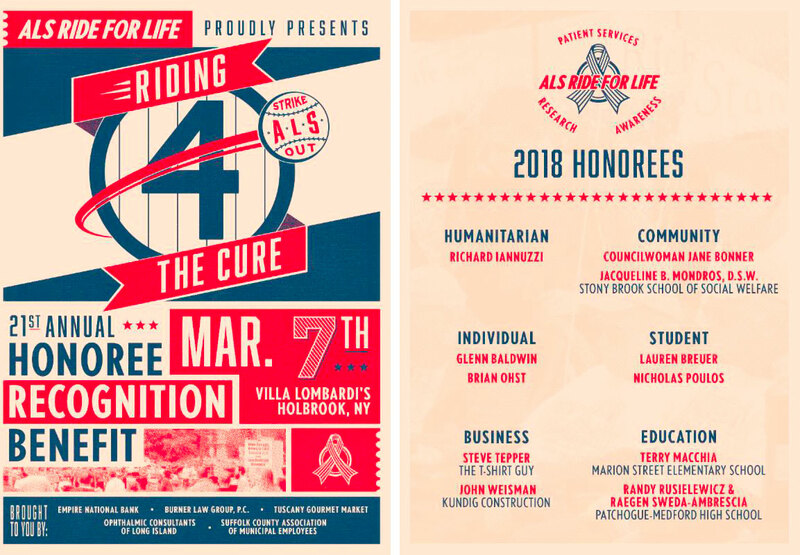 The ALS Ride for Life is very special to the Northport – East Northport Community, and two of our own, Glenn Baldwin and Brian Ohst, are being honored at this year’s Honoree Recognition Benefit. When: March 7, 6:30 – 10:30 p.m.
Tickets are $75 per person or $85 after February 15. R-UTN Member Pamela Waldroup invites everyone to the opening reception of her two-person art show, Photographs & Memories, at the South Huntington Public Library on Saturday, February 3 from to 2 – 4 p.m. The show will run through February 28. The poster for the show, featuring one of Pamela’s photographs, can be seen on the Member News page. Paintings by Constance Wolf, UTN member and Northport High School Art teacher, are featured in the Winners Showcase at the Mill Pond Gallery in St. James from February 3 through March 11. The opening reception is Saturday, February 3 at 2 p.m.